The Louisiana State Museum, affectionately called the Cabildo, is an entertaining and informative attraction in the city's vibrant French Quarter. The exhibitions explore the history of Louisiana from a multicultural perspective, from the first European explorations to the post-Civil War Reconstruction era. The museum is the flagship of the Louisiana State Museum facilities and housed in the historic building of its namesake, dating back to 1799, originally serving as the Spanish city council offices. Two major historic events took place in the Cabildo building: the Louisiana Purchase Transfer ceremonies in 1803, and the landmark Supreme Court decision that legalised racial segregation. 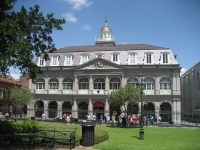 The Cabildo takes pride in the fact that five American presidents have visited it. Opening times: Tuesday to Sunday 10am-4.30pm. Closed Mondays and state holidays. Admission: $6 (adults), free for children 12 and under. Concessions available.